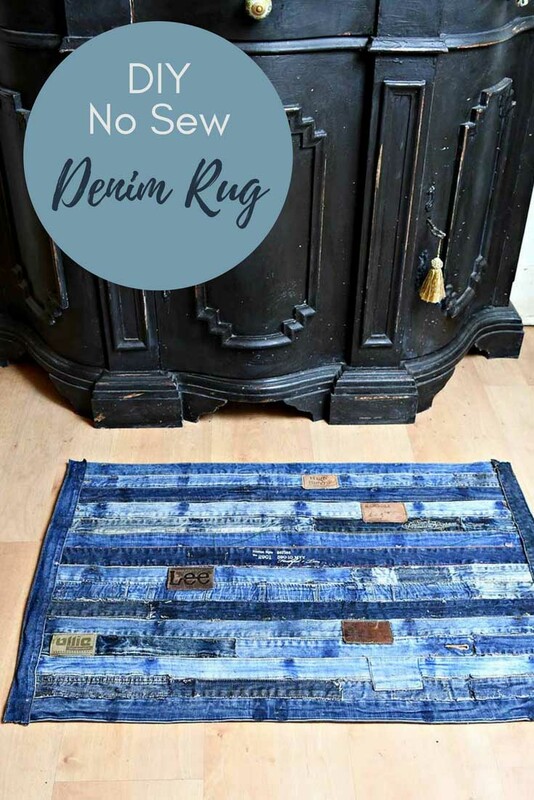 A denim rug has been on my upcycling bucket list for ages. And what a great way to start off a new year of crafting by finally making one. 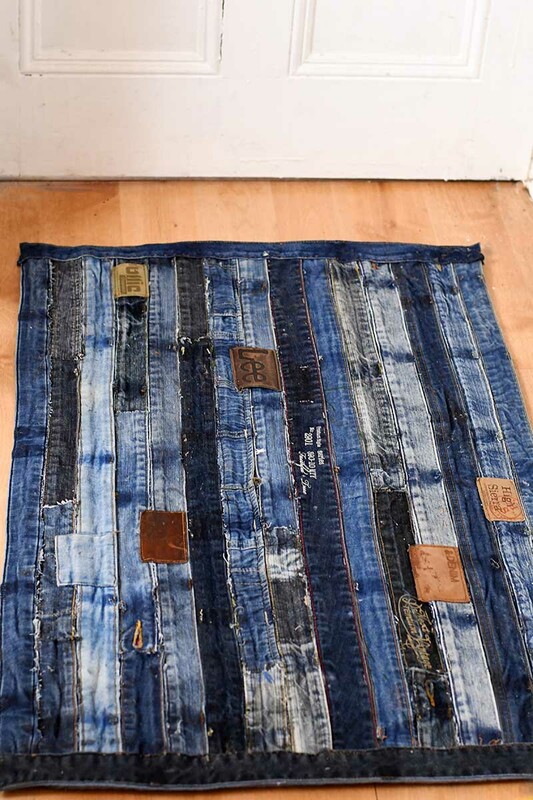 I’m pleased that I can tick the denim rug off my list. But I’m really chuffed with how it’s turned out. 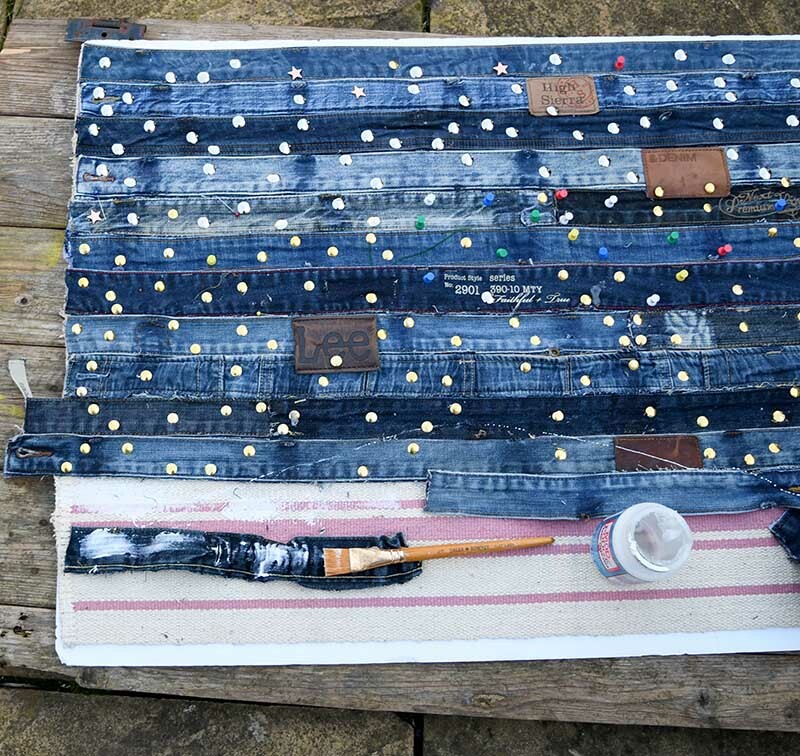 Originally the rug was going to be for my son’s room to go with the denim pocket organiser I made for his wall. Not anymore! I love it so much I’m going to have it on show elsewhere in the house. Probably in the hall or the dining room, I haven’t decided yet. I may just have to make another one. I think the rug looks so good, as it’s made with only waistbands. Which are the most interesting part of a pair of jeans. 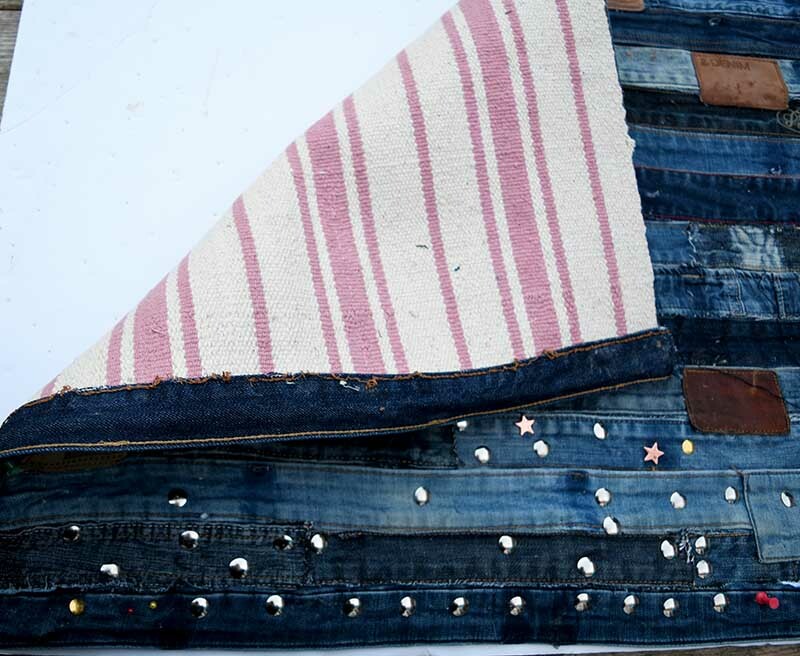 The striped effect from all the different shades of indigo and the odd leather label really give the denim rug character. I have used all the families old denim and so I can recognize the waistbands from some old favorite jeans. 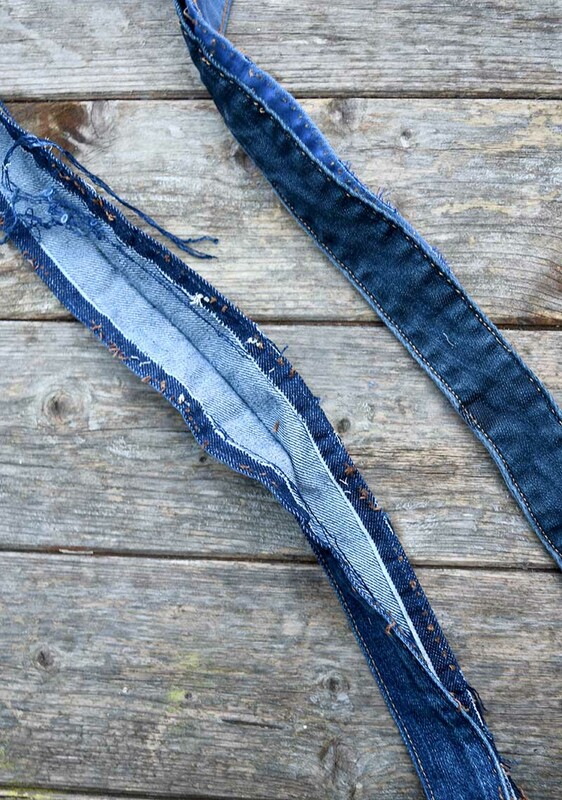 As they are so thick denim waistbands can be a bit of a pain to sew. That’s the beauty of this rug DIY, it’s a no sew one (yeah!). 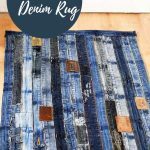 Which has to make it one of the easiest upcycled denim rug tutorials. I used an IKEA Signe rug as my backing for this upcycle. That actually then makes it an IKEA hack, so I can tick that box too. 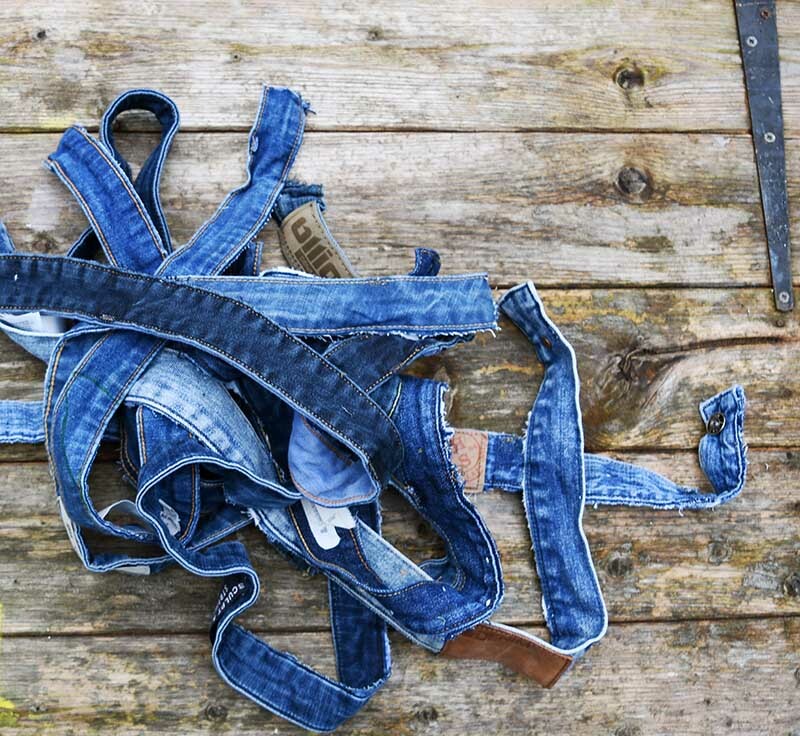 Denim waistbands from old jeans. IKEA Signe rug or any other small rug or non-slip mat. 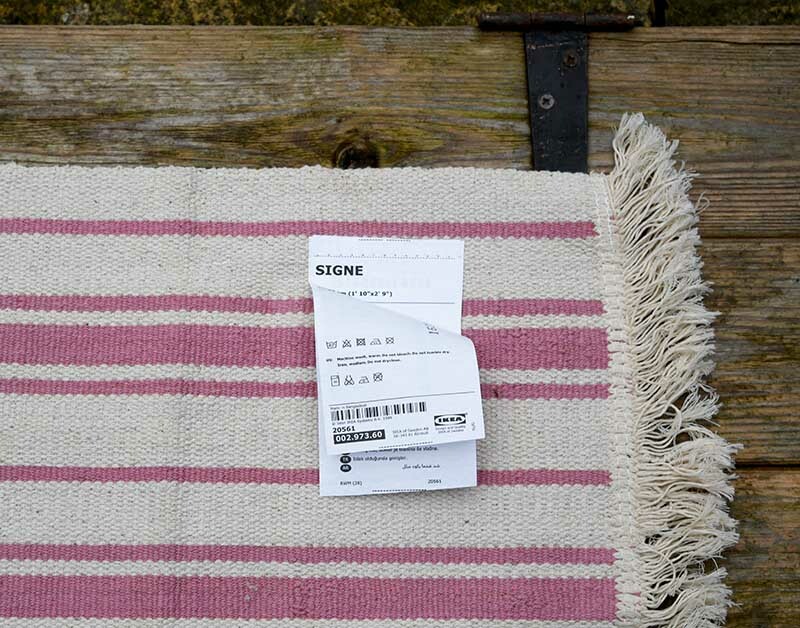 The IKEA Signe rug is only £1.90. That’s why I used it. It was cheaper than buying a non-slip underlay. Fabric Glue – You will need a lot of this, at least a whole tub. Gorilla glue contact adhesive clear is a good glue to use as it’s waterproof. Large foam board or cork board. ( Preferably as big as the rug). First cut the waistbands from the jeans as close to the seams as possible. Use a mixture of jeans waistbands from dark to light denim to show off the shades of indigo. Don’t worry if some of your waistbands are not intact or are a bit small. All bits of the waistband will be useful. 2. 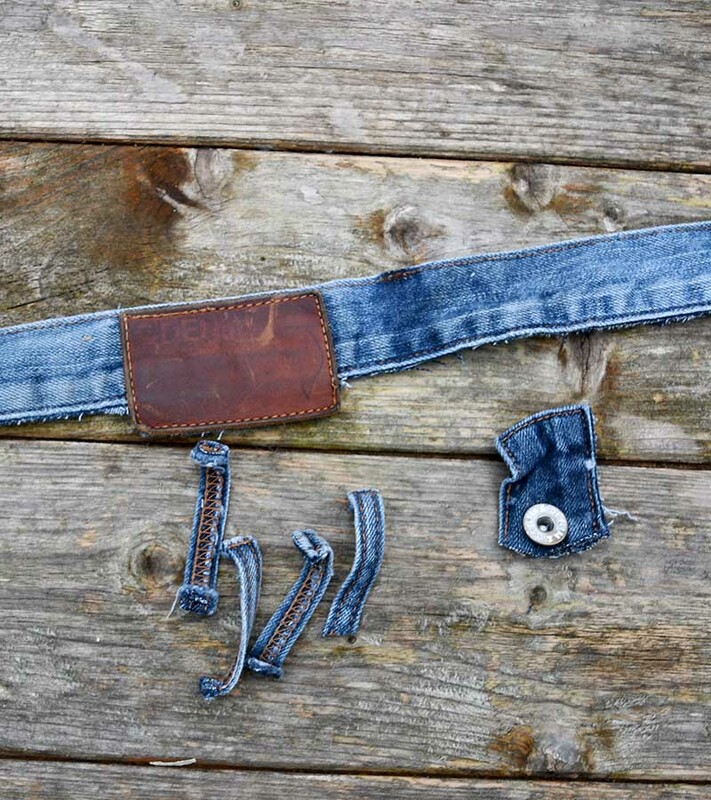 Cut off the belt loops and save them for another project. However, if the waistband has a nice leather label on it, don’t cut that off. Labels will add further interest to the rug. Snip off the end of the waistband with the button on. As I didn’t think to stand on a jeans button in bare feet would be very comfortable. A bit like standing on lego but maybe not quite as painful. 3. Next, cut the fringe off the IKEA Signe rug and lay it down on top of the foam board. 4. Assemble the rug using the same method I used to make my jeans handmade advent calendar. That is I apply glue to both the rug and the back of the waistband and then stick them together. 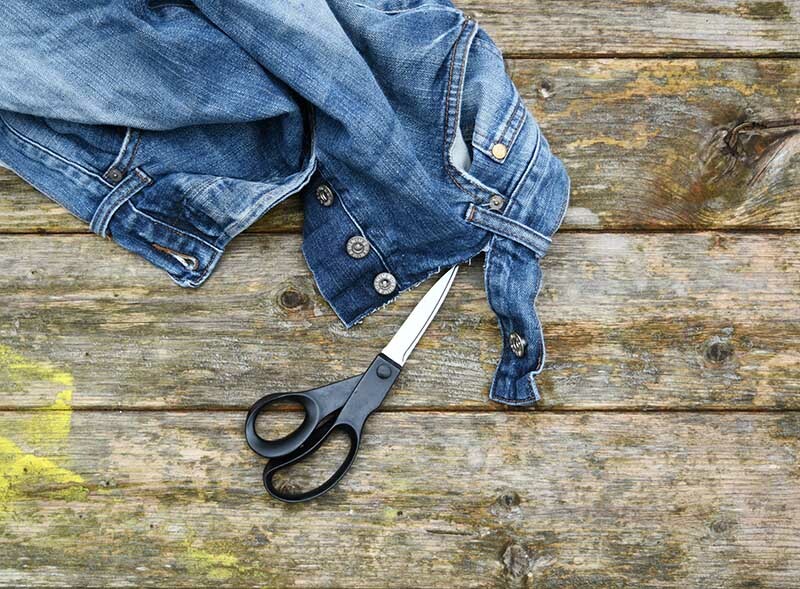 To ensure that glue adheres to the fabric use thumb tacks to hold down the denim as it dries. 5. The denim waistbands were stuck down in strips. Sometimes the waistband was long enough to cover the whole width of the rug. Other times I used 3 or 4 waistband offcuts to make up the width. 6. Carry on until the whole rug is covered. Then trim off any overlapping excess. 1. Finally to neaten up the edges of the denim rug. Use 2 waistbands as binding, as I did with my recycled sweater blanket. Firstly, split the denim waistband open at the seams. 2. Next, apply glue to the inside of the waistband and then sandwich the edge of the rug in between it. 3. Finally, once all the glue has dried remove all the thumbtacks. With fabric glue, you should be able to wash the rug with warm soapy water if needed. 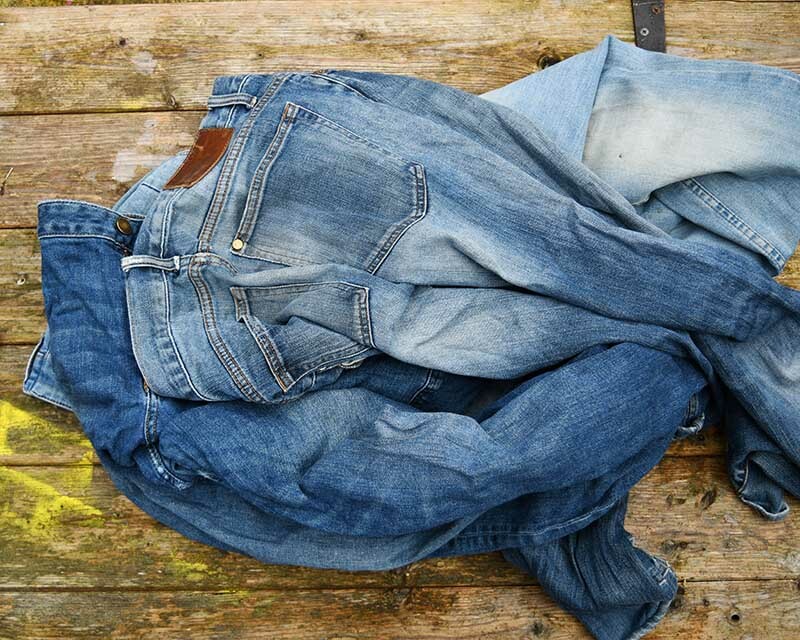 But as you know denim is great for hiding the dirt. I’m so pleased with this rug. So, I’m now saving up my denim scraps to make an even larger one. Hopefully, it won’t take too long. My family and friends know how much I love to upcycle denim so they happily hand me over their old jeans to repurpose. I’m sure if you let your friends and family know you are after old denim they will happily give you their cast offs. If you are wondering what to do with all the other bits of denim from a pair of jeans you should check out my denim page for inspiration. 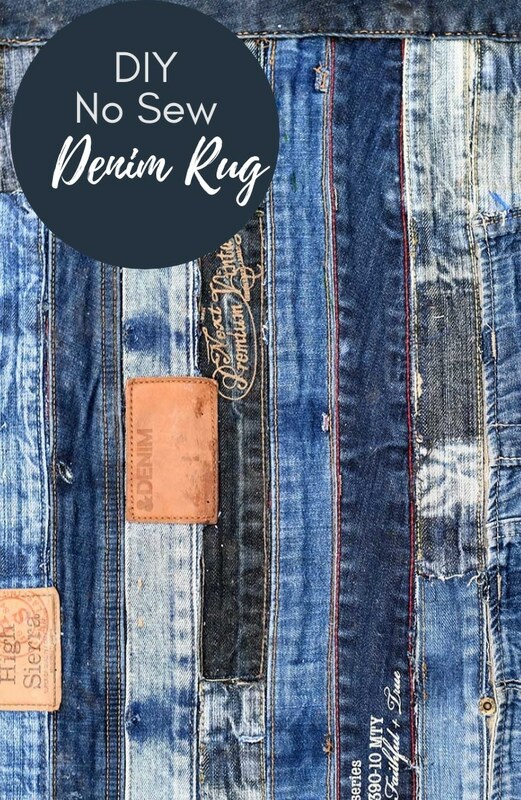 Or visit the DIYideacenter for even more denim ideas. Fabric glue is washable so you could hand wash the rug with cool water. Thank you, I know denim can be difficult to sew with that’s why I wanted to show a no sew version. I am thinking you could make some cute, casual placemats with this process. It may take a lot of jeans, but just a thought. 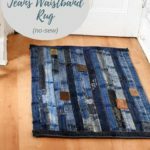 Yes you could make placemats this way and you could also use the hems of jeans too! I love hearts n stars and have created things since childhood..your crafty ideas remind me of things I made for around the house when my son’s were growing up..thanks for your articles.. Thank you so much Brenda. I’m glad your enjoying my crafts, I have 3 sons myself! Thank you Lins. Yes I deliberately kept some of the labels to add interest. Well this is just fantastic! Your creativity with denim really is something else! Thank you, Julie. I am really pleased how it turned out and it looks great in my hallway. Oh you had me at no-sew! Thanks for sharing with Party in Your PJs! Thank you, yes no sew is good! This is wonderful! I would like to make a no sew blanket or cover. Not with waistbands, but the rest of the fabric. Do you think it could work? Thank you. I’m not sure about a blanket as with the glue it maybe a bit stiff, which doesn’t matter for a rug. You could try a small one first. What a GREAT idea! I’d love for you to come share at Let’s Party https://themarkandjanshow.com/2018/01/17/lets-party/ … we look forward to seeing you there! Claire only you can come up with ideas to use up every square inch of a denim pant. This is such a smart and fun rug. And of course you know I just love that color. Thank you Mary, no part of a pair of jeans is safe with me. I’m even trying to work out what I can do with all the buttons snipped off the waistbands. This is fantastic! I love the new sew. And such a cool look. Thank you, yes no sew makes it easier especially with thick denim. Thank you, Michelle. 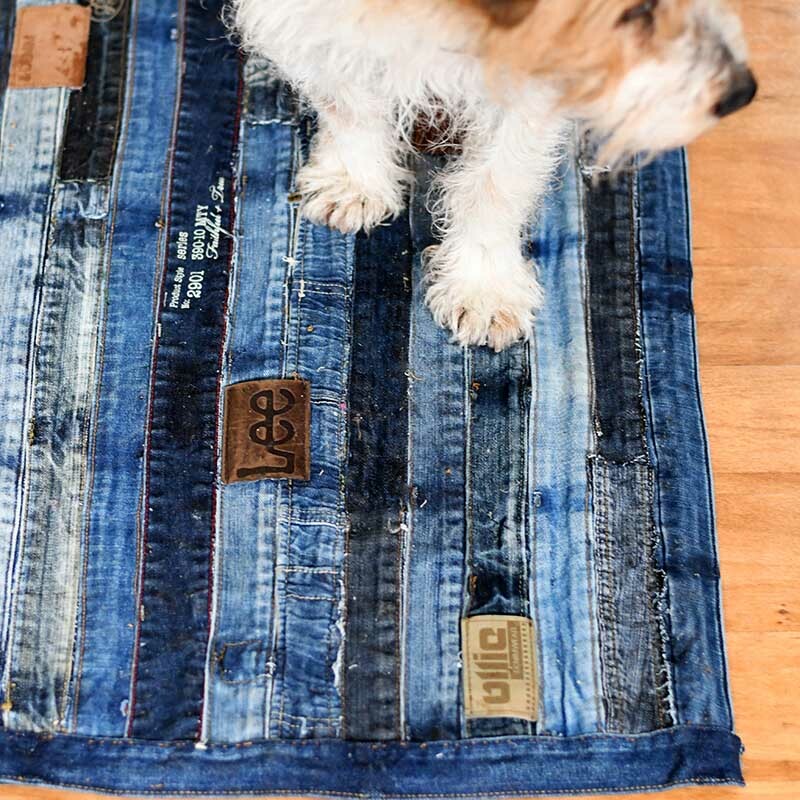 I just can’t stop upcycling denim, it’s my favourite fabricto work with. I think it’s partly to do with the fact that I love indigo. What a great way to repurpose all that material! I absolutely love this rug! What a fun and creative rug! Ahh thank you so much, I look forward to seeing the feature. Thank you, that’s something I need to try a t-shirt rug. That’s so great! So what do you do with the rest of the material and why only use waistbands? Can you not cut a jeans lengthways and use strips to achieve the same effect? is it that the waistbands are stronger? Either way, we love! Thank you Jenny. Don’t worry no part of the jeans are waisted, I use the other bits for other denim upcycled. I like the waistbands as they are they often have interesting bits on them. Also they are double thickness and stitched round the edge so more durable and won’t fray. Wow, this is a clever idea! Love it! Such a clever idea! I Love the fact that it doesn’t need sewing and that it is washable. How long it took you to compleat it? Thank you, it didn’t take long at all about 2-3 hours. I did it one Saturday afternoon whilst catching up on some Netflix. The rug looks great. Really clear instructions and I can’t believe you don’t even need a sewing machine! 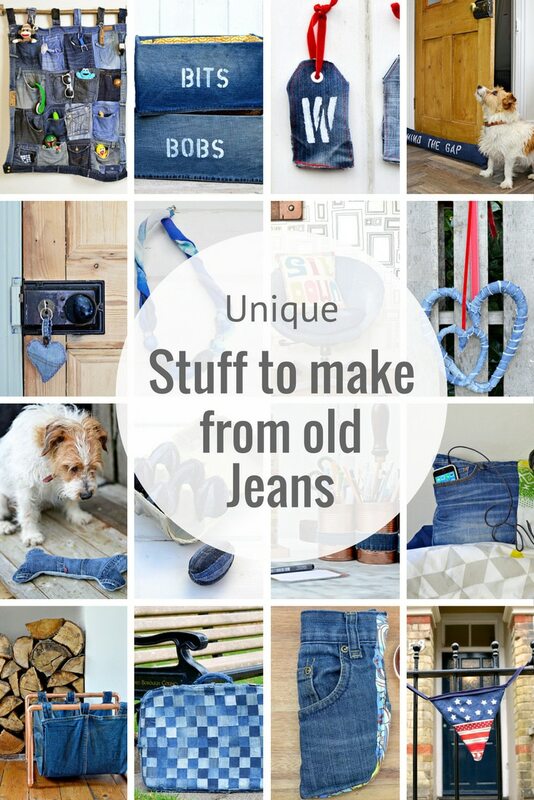 I need to start saving up old jeans to try these projects. Thank you, yes no sew projects are easy. This is such a cute idea and so easy to make. If it was a wall hanging, we’d leave the tacks in! Thank you, I thought it would look good as a wall hanging too. Brilliant! You make it look so easy. I need a few more pairs of jeans though but there’s a jumble sale coming up soon. Love your dog bone too, I don’t have a dog but perhaps I could do a fish (on a rod) for my cat? Thank you. I like the idea of a denim fish. 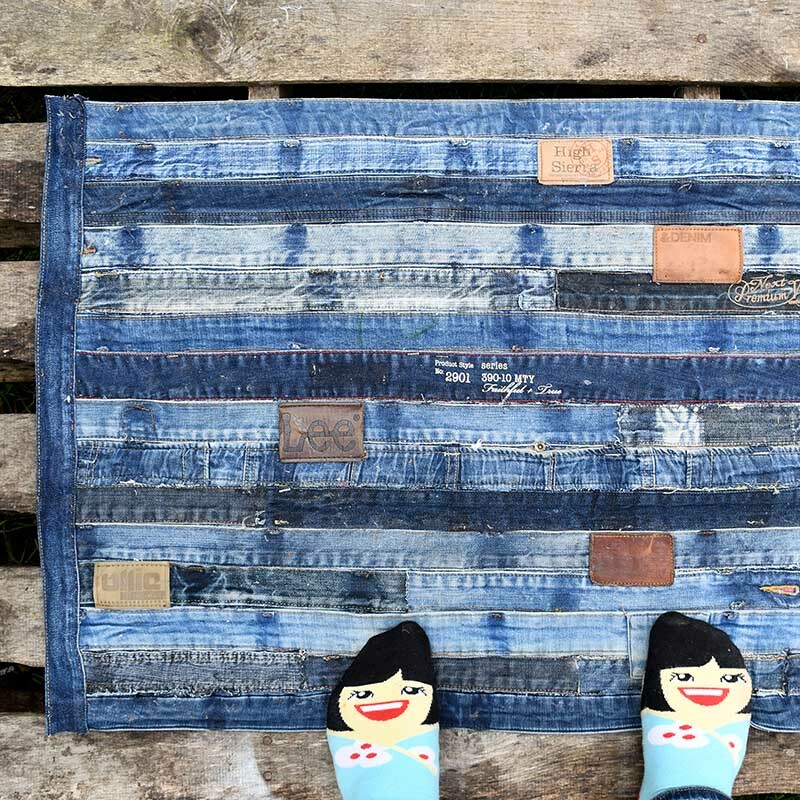 What a fabulous denim rug!! The fact you don’t need to sew it is even better.. I do an occasional sewing project but I must say I am not very good at it.. very cool & original project!! I absolutely LOVE it! Thank you, Evija. I do like sewing, it’s just that denim waistbands can be difficult to sew on domestic machines. A great idea – and I love how simple it is to make! That looks great. What a good way to recycle. fabulous Claire, as always! 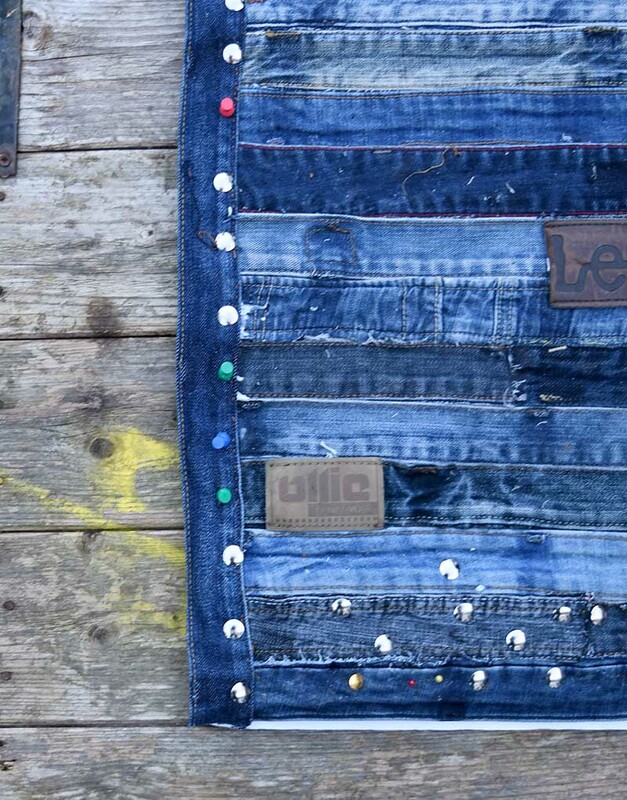 you have amassed quite a collection of upcycled denim DIY projects! I need rugs that can be tossed in the washing machine as our area is so very very dusty. So thinking that maybe this could be sewn on an industrial machine, for those lucky enough to have such a work horse. thanks so much for sharing on craft schooling Sunday, great to reconnect! Thank you. I still have a load more denim crafts on my bucket list so watch this space. I did think about sewing the rug but I know not many people have an industrial sewing machine that’s why I came up with the no sew version. When I’ve glued denim before it has queen suprisingly robust. But if you can sew one that’s even better. This is so fun, Claire! Thanks for sharing at Vintage Charm! Thank you, the waistands of jeans are my favourite bits. They often have interesting bits on them. Thank you, Angie. Yes this rug is the easy version. I save my waistbands just for something like this! It’s good to know that there is a no-sew option. Is it stiff feeling or still fairly flexible? Thank you, Kirsty. It is a little stiffer than a normal rug but still flexible, but that is fine for a rug as you don’t notice it under your feet. Now I know what to do with all of the jeans I can’t get rid off because I know I can make something from them. The rug looks fabulous. Thank you, Debra. 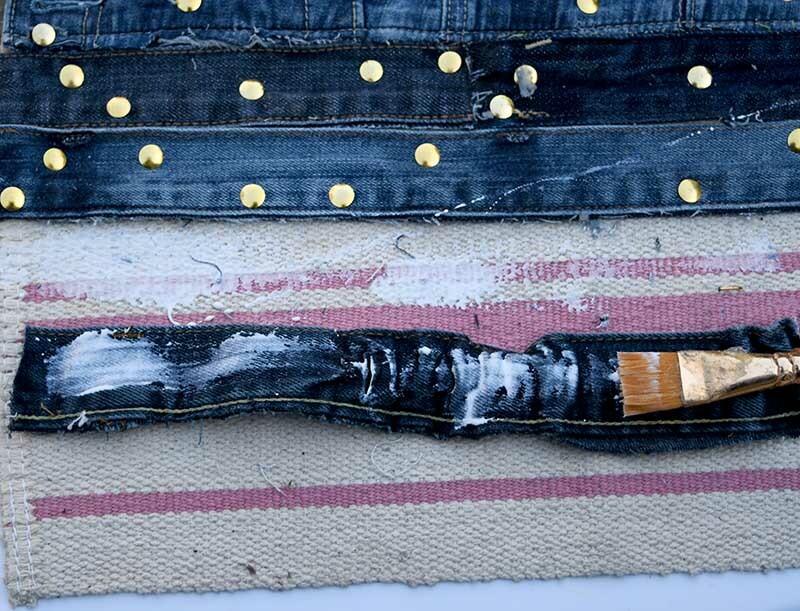 You can make so many things with your jeans even if you don’t like to sew. Thank you, Vicky. NO sew definitely made it easier. Good luck with the new house. Thank you, Kathe. I’m saving up more waistbands to make another one.